I walked by a guy selling Khao Soi and he was again in the traditional Thai denim/cotton shirt and pants with a rattan safari hat. I wasn’t sure if it was the right place so I keep on walking to the back of the market looking to see if there was another one. For all I know, he could be faking it. “this is real good” passed your mind the bowl was empty. Sara passed by and see me finishing a bowl, but she was already full and decided not to try it, even as I insisted that this was the best thing in the market, if not the whole of Chiang Mai. Sara was really into green curry and everything she had the option of ordering, she would every time eat it. Also she was into the simple mince pork or chicken stir-fried with sweet basils and chilis with a little bits of garlic on top of rice and a fried egg on top of everything. This dish is equivalence of a hamburger for Thai lunch. I don’t think it is common in Thai restaurant outside of Thailand, but the simple wholesomeness of the half raw runny egg yolk on top of this dish mixed with the secret ingredient of oyster sauce with your daily dose of MSG would take it to the next level. We usually put a dash of ‘Nam Pla Prik’ which sit on most table of Thai quick cook restaurant, consisted of fish sauce, lime juice (hopefully made from real lime), and small thinly sliced fresh bird eyes chilis. That’s the real crazy spicy chili. Even-though they are real small, they can still be extremely spicy the the uninitiated to the capsaicin effect. It is interesting that chili pepper came after the Columbian Exchange, which meant that no one in Asia had a taste of it before 1500’s. Now proper Thai food are known for this burning sensation. And if you can eat spicy food, life become very interesting trying everything the food culture in Thailand have to offer. It was unfortunate that Sara was not into spicy thing, but by the end of the trip I got her to try some quite spicy Laotian food by the time she was departing for the Southern Island. After we finished the Sunday market walk, I can only think that I have to go back to get a rest at the hostel. As we walk back I can feel my legs are loosing their energy and my muscles are just not wanting to keep walking anymore. I have the feeling that only will the long rest for night can help me recovered the next morning. Under my feverous condition I was thinking that if I don’t book all our accommodation all the way to Luang Prabang now, it would not be so smooth and I didn't want to be carrying my sick self walking around town to look for a place. 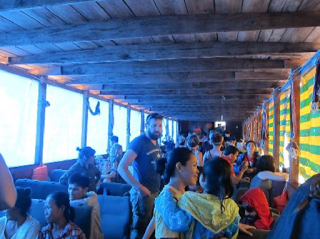 So I decided to just call up all the places I used last time to book them and using internet to book the worse part of the trip at the slow boat to Luang Prabang midway stop in Pak Beng. I just book a place that look the most comfortable without paying way too much. After that I went down stair to ask for an extra bottle of water and as we got back upstair, I just went up to my room and just passed out on my bed. Then about half-pass mid-night when I woke up and as I was feeling pretty awful with the cold and the fever, headache, and sore throat. I decided to walk downstair to the bottom of the hostel and grab a free bottle of water from the refrigerator. Right before I got out of the room, I decided not to bring the key and not lock the door thinking there is no one to come in to steal anything. I walked downstairs to the first floor and at the bottom of the staircase there is a door that separated the small ‘lobby’ and the staircase upstair. I open the door and close it without realizing that it would lock behind me. By the time I came back with the water, it just notice that now I have been lock out from the comfort of our bedroom and the bathroom. I keep banging on the door loudly but no one can hear me the hostel was pretty empty, I believe that night there was only Sara and me and another couple of American girls. But not of them can hear me now. I keep thinking that I only have to open the lock somehow and try to pick at it with paper clips and other things. But It was no avail. I was stuck at the lobby only the refrigerator and lots of water but no bed or no bath. After half an hour of trying to pick the lock, I settle into the space and try to see if I can make it more comfortable. Then I got the urge to pee and realized that there is no toilet on the first floor. I had to come up with someway. The first thought was to pee on the street, but that seems a little barbaric. The area was kind of a local shophouse in the alley way that was typical of Thailand, but anyway I need to go soon. Finally I got out of the front door and look for a place to relief myself, then immediately in front of the hostel there was a trash can! So that was where I went for the less of the night to urinate. And I kept going the whole night, my thought was to drink a lot of water, like gallon and gallon so I can get better the next day. So a gallon going in was also a gallon coming out. That trash can was full in the morning. The street light was coming in through the front door pretty bright and it was keeping me up into the morning. So I had to find a space behind a coffee table to hide my eyes and I grabbed a pillow from the sofa, which was too small for me to sleep on, so I was laying on the floor with rattan mats and it was good for a few hours of sleep at the time before I woke up again to pee outside. Once the Sun came up it was close to 6am. The American girls came down very early and I was able to tell help to open the door for me, then back to the room to get another 2 hours of sleep on a proper bed. That next day, Sara and the hostel owner was surprised that I had to sleep downstair the whole night. the owner asked why I don't call her, but I didn’t have anything on me when I came downstair, and If I had a phone I would have call Sara to come down to open the door first without the need to ask the owner to came from her home. It was one adventurous night for me, and a lesson on taking your key, and phone with you wherever you go. I decided to go get a rental scooter from the place that have been renting to me 2 times before, they had a pretty new bikes and only asked for a deposit of 3,000 baht. But once I got to the shop the girl at the shop that rented to me the first time told me that they no longer rent to Thai National anymore. Her reason was that they had too many trouble with Thai people renting their bikes. I wasn’t how that would be bad for their business, but ok so they don’t rent to me with my Thai ID card, I said I am also an American, but I did not bring my passport with me. Her answer was no passport, no bike. So, I walked to another place right in front of the street where the hostel was at. And it was 5,000 baht deposit and I had to leave my Thai ID, it was a decent click with empty tank not like the other place which have full tank when you get a bike. Anyway it will do, just had to go to the closest gas station and fill it up, and sure, you filled it almost full since you don’t think 40 baht was enough to ride around the whole day so I get another 40 baht on top of the first 40 baht. But of course 40 baht was more than enough for the whole day of riding. We rode up to Doi Suthep to go see the Wat Doi Suthep. As sped up the hill, it get cooler and cooler the higher the elevation. 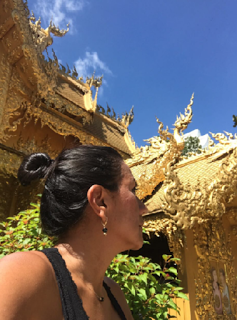 And at the Doi Suthep temple, you needed to go up the long staircase of more than 300 steps to the temple which at my current condition I declined and tell Sara to head up to the temple on her own. I just got a bowl of noodle and sit at a cafe to wait for her to come down. I briefed her about this temple a little and told her to make sure to take in the spectacular view of Chiang Mai City. By the time she finished and head down from the temple, we jumped back on the scooter and rode to the Phu Ping palace, which was only a few more miles, but during this ride you can feel the weather get much cooler and the air was reminiscence of Alpine forest. I just had the feeling that I would feel more sick if we kept stay up here long. But Sara was quick at the Palace. The only that took time was getting the sarong to wear so she can be properly dress to go into the palace. After about 20 minutes wait she came back out and said it was not worth the ticket and the cost of the sarong rental to just go into to see a garden. So, we sped back down the Suthep hills and back into Chiang Mai. Visit a couple of important temples and museum then we were back to return the scooter and grabbed a Grab Taxi to the bus station. We had an hour and a half at the station, so I introduced her to the massage place upstair of the station which was really a great place to get a massage. I had one of the best there last trip, just so relaxing for 2 hours. But as I was having a fever, they recommend me to just get a foot massage with was not something I really like but it was have to do. We had a great time there and afterward we realized that it was raining very hard outside. It was very fortunate for us to have been at the station all along and now we didn’t have to fight the rain to come here. The bus was just waiting for us to get on downstair without being wet and cold. So the VIP bus ticket that we got earlier paid off now, we were on a comfortable bus right all the way to Chiang Rai, with only the cold A/C to content with. I broke out my tower and used it was a blanket, which Sara got her scurf, we were riding in style. It rained on and off, heavy and light all the way from Chiang Mai to Chiang Rai. When we got into Chiang Rai it was still raining and got to our guesthouse on the back of a red public pickup truck or “Songthaew,” which literally means 2 rolls of seat in Thai. They are essentially working as small public bus and taxi roll into one in the Thai countryside. We got to our guesthouse at 10pm and start to ask the guest-house people about something to eat, since we didn’t want to walk in the rain we ask if they still serve dinner. They said no, it’s too late, and they also said that it is a Thai Mother day which is the Queen Birthday in Thailand. That would mean that everything was likely closed that night. We just got a bowl of instant-noodle each to fill up our stomach for the night. The Lady at the guesthouse see me quite sick, so she offered me a huge mug of ginger, lime, with honey which I manage to almost empty the what left of half a small squeeze bottle. I also got a couple of industrial straight Ibuprofen to help me with my high fever. I thought of Sara day tour and decided on getting her a tour of the Chiang Rai area by van the next day, this way I can take the whole day to rest and recovered. That whole night it was raining cats and dogs. The rain was making so much noise! The wind was howling like crazy! I was up 5 times during the night to listen to the thunders and rain drops all night. Both the A/C and the fan was unnecessary with the unusually comfortable low temperature. The next morning after full breakfast, the came by and pick her up the the day tour. I was crossing my finger and hope that it would be really good tour for her. and told her to take lots of pictures and report how good it was later. That day was really just a long day of naps and hanging around watching youtube all day. It was exactly what I need to rest and recover from by cold. The day was sunny and I was feeling much better by the afternoon and walked out to look for a nearly restaurant, and I sat down to have a Hainanese Chicken Rice right in front of the street of the guesthouse. I rested until that night time, when Sara came back from the tour, then we walked out to the downtown Chiang Rai where there is a beautiful Clock Tower which was decided by the same guy who did the White Temple for Wat Rong Khun. We just have some Thai/Chinese style porridge and end the night right after taking some photos of the Clock Tower. 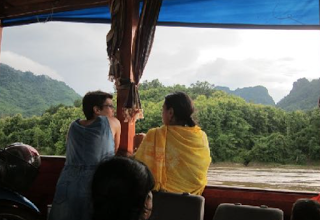 The next day was to be a very long journey day for us to cross the Thai/Lao Border and catch the Slow Boat to Luang Prabang. Since we will rock and roll from a very early time, I called the taxi call center to order a car, but there is an extra charge for that, so I decided to went with Grab Taxi instead. The driver call me back to confirm the time of 5:45am since the red bus for Chiang Khong was gonna leave by 6am. When morning came, we were already packed and locked and loaded for our public bus ride in the morning. We forgo our breakfast to catch the red bus. We got on the bus and met up with another German backpacking kid who is doing his gap year right after graduating from his university majoring in biochemistry. It was a good morning ride all the way to the border, which I learned the hard way last time that you needed to get off at the Thai/Lao Friendship bridge where the new border crossing is located, instead of heading into town of Chiang Khong and have to back tracked by a Tuk Tuk to the border crossing. The three of us share the Tuk Tuk cost. At the border we cross easily enough after Sara cleared her decease control and got a reentry permit from the immigration officer at the border. It cost her 1,000 baht to do that. We ran to the border service government bus as it was leaving, got on and ride to the P.D.R. Laos which we say stands for Please Don’t Rush Laos due to the relaxing nature of people, culture, and how things are run in Laos like bus and boat schedule as well as how relaxing everyone there seems to be. From the border we rode a pick up truck to where the slow boat pier located, and from my previous trip, I made sure I exchanged the Thai baht to Laos Kip right after the immigration. Actually I made the mistake of using the ATM machine which give me a very bad exchange rate but it was just enough to cover the cost of our slow boat tickets and I was still ahead with more than 200 baht to spare. I make sure we got the best seat on the boat, these are seats at the front of the boat that face forward, and not the ones that face each other, those will be use by local laos getting on and off the boat during the cruise as people come in and out during each stop along the way. So these were like musical chairs where you will be squeeze by locals, scooter, and stuffs that Laotians’ luggages which they usually pack into used rice sack, all these are being transported along the Mekong river by our slow boat in the direction of Luang Prabang. For the front half belong to the locals laotians, the slow boats are regularly used as a transport by locals and they were getting on and off along the way with a much shorter distant trip than the backpackers and most doesn’t travel the whole length of this route from the border all the way to Luang Prabang like the foreign tourists. The boat we got on this time was a little bigger than the one I got on last time. It was also equipped with 2 bathrooms with the Asian style squatting toilet. I preferred the last time boat, it was a little more cozy but I have a comfortable seat in the front with wooden bench. This time the seats were taken from automobile, with a small reclining ability, but without the seats being attached to the floor of the boat, it was not really more comfortable in that sense. 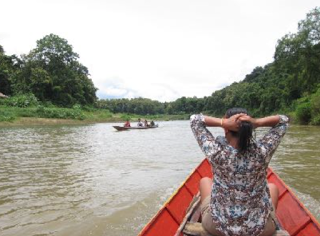 I would guess that most people would choose to travel by plane instead of a slow journey by boat with locals unless you were looking for a more authentic experience or need to kill time instead of money. But once you forget about the comfort level, boat can bring you much closer to the local life and see how people really live in this poor country, who when you think carefully about them, they are rich in the heart, doing their best with little materials’ comfort. It’s a big contrast to our country where huge advance in development have taken place or in the process trying to improve our lots in the world standing while loosing a little of our soul in a trade off to the richer world of material success. Any way you can decide only after you have seen both side of the fence. After the first 6 hours that afternoon riding along with view of magnificence and best example of the rain forest of South East Asia growing on the hills and mountains of Northern Laos, we made an overnight stop in a town of Pak Beng. From the first look at the pier when we arrived, this town primary economic activity must has been the daily arrival of the backpacking tourists, which trigger the group of about 25 touts who were trying to get the tourists coming out of the boat to go to their hostel or guesthouses. Sara and I got off and waited for our bags to be off load. From my experience last time in this small town, I have already booked 2 rooms for us in a place that look good on the photos and have a reputation to be very clean and next to the pier so we don’t have to walk far. Once we got the place, the people at this guesthouse show us our room but then mentioned that A/C was not included in the price and ask for the remote control back. They wanted 200 baht extra for each room, but I negotiated for 100 baht for just Sara’s room, and since I was sick, I was just going to sleep without the use of an A/C. We then went out to eat at the place opposite this guesthouse which I tried last time I was here and their noodle was pretty good. Sara ordered stir-fly sweet basil with minced pork. I had a bowl of Lao style Khao Soy with topping of minced pork which look closer to Vietnamese Pho than the Chiang Mai style curry Khao Soi. My first thought of Laotian food would be that it is saltier than Thai food. Thai people seem to have a sweeter tooth. Lao food wherever we tried, the restaurant would have a condiment of MSG right on top of every table. Maybe that would go to help explain some of the saltiness. Is MSG going to kill you, I’m not sure too. A popular belief in the States is that large doses of MSG can cause headaches and other feelings of discomfort, known over there as the "Chinese restaurant syndrome," but double-blind tests fail to find evidence of such a reaction, in the U.S. Food and Drug Administration test back in 2012. So I would not mind eating a little of it while I am here in Laos. But at home we would rarely put this chemical in our food, unless I was eating instance noodle. It’s interesting how most of the food borne allergies happen a lot in the first world countries. In the developing countries, it is pretty rare to find too many people who develop food allergy when they are older, maybe the only exception is Lactose Intolerance which is very wide spread in most East Asian countries including Thailand. After dinner we when back to our guesthouse and I felt fast asleep until the next morning when we got up and went out to breakfast, at least unlike my last trip we had hot water for shower. We got to the pier and another thing unlike my last trip was that we got on the same boat that took us here to go all the way to Luang Prabang. Maybe due to the sizes of the boats that they use to run this routes. At one point on the long journey it start to pour heavy rain. As the rain was getting harder, the boat captain made a turn to port, then a huge amount of water started to shower all the passenger on the left side (Starboard side) of the boat the wind was so strong that half of the boat passenger was getting wet. Everyone scrabble to the other side of the boat to avoid getting wet. Then people notice that there are plastic curtains that was already in place for the rain we all just have had to untie the plastic string to release all the curtains. And that was what everybody did almost in unison, then 5 second later we had the whole length of the left side of the boat covered. Then another 5 second later the boat have turned to the other side and the left in turn is now received that same treatment with rain streaming into everyone. So we copy the right side people and deployed the rain cover on our side as well. So after everyone along the side of the boat wrestle with the rain plastic canvases, we were all safe from the wet rain. After about 10 minutes of heavy rain, it stop to a trickle for another 5 minutes then the rain stoped and we were able to see the sun again. The boat made a brief stop to pickup more passengers at this village, but this time the they had to bring one man on the back of a small 3 wheelers pickup scooter. I can tell that he was looking very sick. 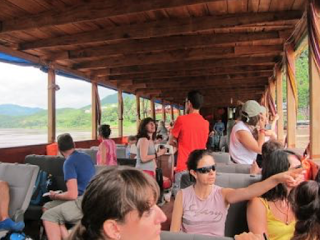 It look 2-3 guys to load him on to our slow boat and his family came along for the long journey to Luang Prabang. A Little later on after the boat have left the pier Sara was talking to other Spanish speaking passenger and was able to get some understanding of the man illness. It seems that he have been having a strong headache for over 2 months without any medicine at the village disposal able to help. I assumed he might have some form of brain tumor and probably need a sophisticated and a very complicated surgery. Which would means he needed a very good hospital. Then I remember that Laos have one of the lowest number of doctor per capita in the world. Does this mean that he would have to travel to Thailand for a treatment or maybe there is a volunteer force of doctor without border that would look after him here in Laos? Has his family bring him to traditional healers and they might have exhausted all their supposed abilities to heal him, and have given up on treating by trying to chase away the evil spirit(s) that might have caused his headache? Is he being forwarded to the big hospital in Vientiane for treatment by the government. How is his family going to pay for the treatment and does the communist government in Laos help with the medical funding. Laos P.D.R only spends less than 5% of it’s budget on health care system in the country. UNICEF considered the effort to construct a primary health care system in Laos to have failed in it’s entirety. According to a book by Ireson, W. Randall. This help to remind me that the health care system in Thailand have advanced years ahead of our poorer neighbor. And it is something that you could rely on in time of sickness, without worrying about the high price like in the good old USA. Where the birth of my first son would have cost us more than $16,000 with out insurance. Compare that to the hospital bills for my second son, it was only less than $3,000 at the best private hospital in Thailand. It was at Bumrungrad International which was as modern and advance as any hospital in America. It is no wonder that Thailand is one of the top destination for medical tourism in Southeast Asia region. Sara mentioned about the healthcare system in Colombia, which was mostly run by government without much input of the healthcare professionals. She told me that her boyfriend is a medical doctor in Colombia. Anyway the medicine she passed me which I took the night before was working pretty well, and I was feeling better by the hour on the boat and after more than 16 hours for both days boat ride, and the night of good sleep at the town of Pakbeng. I can feel that my energy was slowly coming back to me! Maybe the clear air along the way and the simple big bowl of noodle the night before help along a little bit as well. Once we got to Luang Prabang the pier that the slow boat stop at was about 10 km out of town and we had catch a Songthaew service at the desk set up by authority and pay 20,000 kip to get into town. The driver ask for our hotel, but I just tell him to drop us at the center of town. I already called the old guesthouse that I tried last time, which as good enough for our use. I just make sure Sara had a room with a bathroom inside. This was a place a house back from the view of the Mekong river. If you hang out at the fence of the house you could watch the Mekong flow by. But that was the last trip! For this time there was a construction right where you could look out to see the view. It was mostly blocked this time which was too bad. It was better than walking with heavy bags to look for another that you can never sure if it would be good until you walk in and inspect. For the first night I just walk with Sara to see the night market and try to get something local to eat on the street, which has a very good selection of Laotian style street food which is not too different than Thai Isan (Northeast Region) food. Isan people are essentially half Thai half Laotian. They have so much similarity as far as spoken language, cultural festival, food. Most of the past war between Thai people and Laotian have cause the resettlement of many Laotian who were force to migrate across the Mekong river to the Thai side of the border. As the evening wore on I got to talk to the Thai guy who has now become the boyfriend of the guesthouse owner/manager. He was talking about getting his own place last time, but now he told me that most house have already been brought up by investor, most bend on converting them into guesthouse for tourists. So, he is now semi-permanently settle into Luang Prabang which is actually reversing the past 250 years trend. 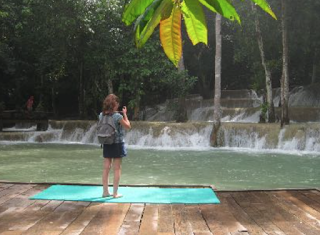 I was now more concern with Sara sightseeing tour of the Luang Prabang area. 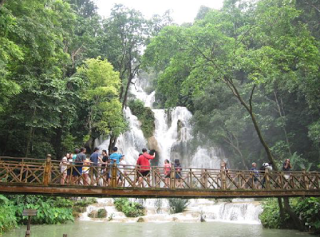 The plan was to have her take the join tour with the van to see the Beautiful Kuang Si waterfall and anything to the west of the city. Last time I went up to Kuang Si Fall, I had to do a 45 hike up the fall to the top to really enjoy this spectacular view and a swim in the pool high up on top of the main fall. But under my condition, I decide not to bring her myself and just buy a day tour for her to join just like in Chiang Rai. Then later that night, the light went out for about an hour. We took out our flashlight and the neighborhood went quiet for about 15 minutes. Then people in the other guesthouse and hotel started to make noise, some singing, maybe other dancing. The Thai de facto manager told me to look up at the sky and we can clearly see all stars, without the city light to complete. They were so brightly lit and you can clearly see the million of stars. Something you would not see if the light were on. About an hour later the light came back on and everyone was ready to call it a night. The next morning, I think I made a good decision on my part, I would not want to be hiking while I am recovering from a cold. Kuang Si Fall is one of the most memorable waterfalls that I have the chance of swimming in. It’s not too big or too small. It’s not too cold to swim comfortably in. The weather was just perfect for a climb and a swim at the top which was a good work out. After she came back from the fall we had an evening of walking to the Phou Si Hill which has a temple on top with a wonderful view of Luang Prabang and the surrounding countryside. It was just right next the old king palace, now turned into a museum for tourist to explore. The palace would be for tomorrow. We had a wonderful evening of clear sky just for that few hours. Late that night we found Utopia! Which was a bar/restaurant by smaller river on the Eastside of Town. Sara ordered Larb or Lao style mint salad with minced chicken, and I had a great buffalo hamburger. We went back to our guesthouse for a few shots of Lao Lao with is a stronger rice wine made from sticky rice that the guesthouse Thai manager got from the corner store. It tasted close to Japanese Sake but a little smell of rice still noticeable. Then we quickly call it a night because I planed to show Sara the early morning ritual of the monks doing their alms round. The next day, after seeing the monks do their round at 5am we went for a breakfast by the Mekong river, it was a really local place that was full of Thai tourists that morning getting their old style coffee and the Chinese donut that becoming harder and harder to find in Thailand. For us we had poach eggs that was served in a small coffee glass that was so common in Thailand in the last. It just reminded me of Bangkok when I was still young back more than 35 years ago, I still remember the poach eggs was still very common for breakfast. Now no longer you can find that on the street or any restaurant. 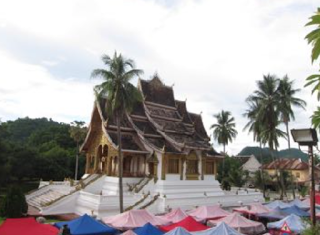 A stay in Luang Prabang just remind you how much things have change and how much they have stay the same in Thailand. Also it make you think how you do you really need in your daily life. Here Mother Nature is still strong and pollution is mostly from the few automobiles that still only few people can afford. Technologies are really a two edged swords, where it provides convenience but cost us in term of the long term degradation of our environment. Any tree hugger will fall in love with this big town in Laos. And you get to understand the P.D.R in front of P.D.R. Laos, really means “Please Don’t Rush” head long into the pollution trap like what is happening in Bangkok and else where in the quickly developing South East Asia cities. I have a secret wish that the countryside in Thailand would remain pristine without the illegal logging and the new shiny cars and are now being pump out from the factory in the industrial park in Thailand. But I'm sure that most people preferred to drive their new toys and show off their new found wealth than to go out to see the forest. But enough with my rattling on about my secret green world wish. Who rather ride a bicycle to work in a hot sweltering sun in Bangkok when you can ride a large air-condition luxury automobile instead. It’s a lost cause for the planet, and our future generations. On our last morning in Luang Prabang, I didn’t really have any plan. It was 8am. We asked the Songteaw driver who always waited in front of the guesthouse if we can go to another waterfall and he recommend Tad Sae fall. So, we check out and pack our back, throw it into his pick up truck and quickly head out. After about 25 minutes drive out of town we got to a parking lot by the side of a big creek where many vans and trucks had already been parked. There were a bunch of very little Longtail boats waiting to take us to the fall. We paid 10,000 KIP each and off we go. As a compare and contrast to the Kuang Si fall, this place is kind of a hidden gem. Not crowded like Kuang Si, and there is an elephants camp that does cost an arm and a leg to see them. If you are not into riding them then just go to feed and only to touch and take photos would make a nice memory of an elephant interaction without taking the expensive elephant tour selling in town. When we got there, we were the first people to there, and Sara just went in to the pool first. The water was pretty cool in the morning, but after a short swim we forget the coldness. When no one is around you feel like you have the whole fall to ourself, which make it special. Then as morning wore on more and more people arrived. It was maybe 70 percent tourist and 30 local. Eventual by late morning it was full of boisterous people climbing up on rope that had been tied to the tree and swinging into the water. I was recovering so didn’t want to stay in the water for too long. I told Sara I was going to be at the restaurant on a higher ground over looking the swimming area new the swing with the nice view of local kids and teens and their parents, effeminate Thai guys and and a group of Thai girls, European backpackers, and a Japanese family, young Koreans and Chinese tourists. After I had a pot of mostly twigs hot tea, then we decided to make a quick departure and be on our way back to the airport in time for a lunch and to catch our flight back to Bangkok. Our driver took a short cut to the airport which was very rough dirt road just right outside of the airport for a few kilometers. 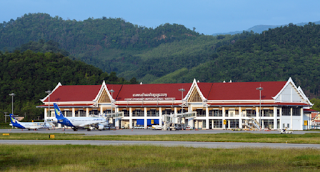 Then in a flash we were at departure terminal of the Luang Prabang international airport. We arrive early, like one and a half hour early. I remembered from my last time here that there wasn’t much food available in the airport due to the high rent. But this airport’s international terminal is very small you would run from one end to the other in 3 minutes. So Sara and I walked out of the airport and ask the people waiting to pick up arriving passenger where would be a good place to grab our lunch. They all pointed to a few small restaurants across the street from the airport. We went to one of the place and ordered a few Laotian dishes, there was Lao style Larb, which is sour and spicy salad with lots of lemongrass, mint, garlics and chilis with mince duck. And a Laos Tom Yam with house chicken, the only different from a Thai style is the lack of coconut milk and a very skinny chicken which you would call free range chicken. We also have grilled Water buffalo meat and a 2 order of sticky rice. All to be chase down with a couple of 1 letter bottle of Beer Lao. As I promised anyone who come on this tour will get free Laos beer the whole journey, I reminded Sara that I will pay for the beer and the food too since it is our last meal together. As it turned out every dish were a much bigger portion sized than what I expected and we had a hard time finishing everything.